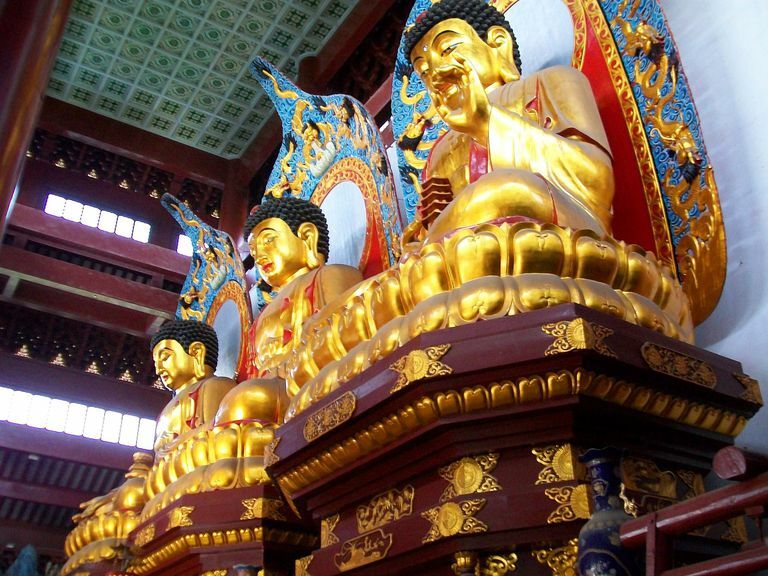 The Trikaya doctrine of Mahayana Buddhism tells us that a Buddha manifests in three different ways. This allows a Buddha to simultaneously be one with the absolute while appearing in the relative world for the benefit of suffering beings. Understanding the Trikaya can clear up a lot of confusion about the nature of a Buddha. In this sense, "absolute" and "relative" touches on the Two Truths doctrine of Mahayana, and before we plunge into Trikaya a quick review of the Two Truths may be helpful. This doctrine tells us that existence can be understood as both absolute and relative. We normally perceive the world as a place full of distinctive things and beings. However, phenomena exist only in a relative way, taking identity only as they relate to other phenomena. In an absolute sense, there are no distinctive phenomena. See "The Two Truths: What Is Reality?" for a more detailed explanation. Now, on to Trikaya -- The three bodies are called dharmakaya, sambhogakaya, and nirmanakaya. These are words you will run into a lot in Mahayana Buddhism. Dharmakaya means "truth body." The dharmakaya is the absolute; the unity of all things and beings, all phenomena unmanifested. The dharmakaya is beyond existence or nonexistence, and beyond concepts. The late Chogyam Trungpa called the dharmakaya "the basis of the original unbornness." The dharmakaya isn't a special place where only Buddhas go. Dharmakaya is sometimes identified with Buddha Nature, which in Mahayana Buddhism is the fundamental nature of all beings. In the dharmakaya, there are no distinctions between Buddhas and everyone else. The dharmakaya is synonymous with perfect enlightenment, beyond all perceptual forms. As such it is also sometimes synonymous with sunyata, or "emptiness." Sambhogakaya means "bliss body" or "reward body." The "bliss body" is the body that feels the bliss of enlightenment. It is also a Buddha as an object of devotion. A sambhogakaya Buddha is enlightened and purified of defilements, yet he remains distinctive. This body is explained in many different ways. Sometimes it is a kind of interface between the dharmakaya and nirmanakaya bodies. When a Buddha manifests as a celestial being, distinctive but not "flesh and blood," this is the sambhogakaya body. The Buddhas who reign over Pure Lands are sambhogakaya Buddhas. Sometimes the sambhokaya body is thought of as a reward for accumulated good merit. It is said that only one on the final stage of the bodhisattva path can perceive a sambhogakaya Buddha. Nirmanakaya means "emanation body." This is the physical body that is born, walks the earth, and dies. An example is the historical Buddha, Siddhartha Gautama, who was born and who died. However, this Buddha also has sambhogakaya and dharmakaya forms as well. Sometimes buddhas and bodhisattvas are said to take the form of ordinary beings so they can hep others. Sometimes when we say this, we don't mean that some supernatural creature temporarily disguises himself as an ordinary being, but rather that any of us can be physical or nirmanakaya emanations of a Buddha. Together, the three bodies are sometimes compared to weather -- dharmakaya is the atmosphere, sambhogakaya is a cloud, nirmanakaya is rain. But there are many ways to understand Trikaya. Early Buddhism struggled with how to understand the Buddha. He wasn't a god -- he had said so -- but he didn't seem to be just an ordinary human being, either. Early Buddhists -- and later ones as well -- thought that when the Buddha realized enlightenment he was transformed into something other than a human being. But he also lived and died like any other human being. In Mahayana Buddhism, the doctrine of Trikaya clarifies that in the dharmakaya all beings are Buddha. In sambhogakaya form, a Buddha is godlike but not a god. But in most schools of Mahayana the nirmanakaya body even of a Buddha is said to be subject to cause and effect; sickness, old age, and death. While some Mahayana Buddhists appear to think that the nirmanakaya body of a Buddha has unique abilities and properties, others deny this. The doctrine of Trikaya seems to have originally developed in the Sarvastivada school, an early school of Buddhism closer to Theravada than Mahayana. But the doctrine was adopted and developed in Mahayana, in part to account for the continued involvement of Buddha in the world.